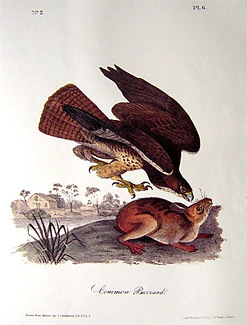 Pictured (right) is John J Audubon’s illustration of the Common Buzzard, today commonly referred to as the Swainson’s Hawk. This hand-colored lithograph is Plate #6 from the Octavo Edition of Birds of America – created from 1840 to 1844. BUTEO VULGARIS, COMMON BUZZARD, Rich. & Sw. F. Bor. Amer., vol. ii. p. 47. COMMON BUZZARD, Falco buteo, Aud. Orn. Biog., vol. iv. p. 108. Female. Bill short, strong, as broad as deep at the base, compressed toward the end. Upper mandible cerate, its dorsal outline declinate and little convex as far as the cere, then decurved, the sides rapidly sloping towards the end nearly perpendicular but convex, the edge with a slight festoon, the tip trigonal, acute; lower mandible with the angle short and rounded, the dorsal line convex and ascending, the edges sharp, arched, at the end deflected, the tip rounded. Nostrils irregularly obovate, in the fore part of the cere, nearer the ridge than the margin. Head large, roundish, flattened above; neck rather short; body full. Feet short, robust; tarsi roundish, anteriorly feathered half-way down, anteriorly scutellate, laterally reticulate, posteriorly also scutellate; the lower part all round covered with series of small scales, as are the toes for half their length, the terminal portion being scutellate; they are strong, of moderate length, the hind toe stouter, with four large scutella, the inner with four, the middle with about eight, and connected at the base by a web with the outer, which has four large scutella. Claws long, arched, compressed, tapering to a point, flat beneath. Plumage ordinary, full, rather blended beneath. Space between the bill and eye covered with bristly feathers; eyelids with soft downy feathers, and ciliate; the superciliary ridge prominent. Feathers of the head and neck ovato-oblong, of the back and breast ovate and rounded, of the sides and outer part of the leg elongated, of the rest of the leg short. Wings long, broad, the fourth quill longest, the third next, the fifth very little shorter, the second longer than the fifth, the first and seventh about equal; first four abruptly cut out on the inner web; secondaries broad and rounded. Tail rather long, broad, slightly rounded. Bill light blue at the base, with the margins yellowish, the tip black; the cere yellow. Iris hazel. Feet yellow; claws black, at the base bluish. The general colour of the upper parts is chocolate-brown. The quills are of the general colour externally, but the primaries are black toward the tip; a great part of the inner web, with the shaft, white, and barred with brownish-black, the bars more extended on the secondaries. The tail is marked with about ten dusky bars on a reddish-brown ground, tinged with grey, the last dark bar broader, the tips paler. The eyelids are whitish, as is the throat, which is longitudinally streaked with dusky. The rest of the lower parts are yellowish or brownish-white, barred with brown. The lower wing-coverts are white, barred or spotted with dusky; the white of the inner webs of the primaries forms a conspicuous patch, contrasted with the greyish-black of their terminal portion. Length to end of tail 23 inches; wing from flexure 17; tail 10 1/2; bill along the ridge 1 8/12, along the edge of lower mandible 1 7/12; tarsus 3 5/12; hind toe 1, its claw 1 1/12; middle toe 1 10/12, its claws 1 1/12. Another specimen in my possession, procured by Mr. TOWNSEND on the plains of Snake river, has the upper parts brown, streaked and spotted with reddish-white; the upper tail-coverts white, barred with dusky, the lower parts as above described. The colours however vary, and in some the upper parts are deep brown, the lower reddish or brownish-white, barred with reddish-brown.